Pivotal Software, Inc. combines platform, tools, and methodology to help the world’s largest companies transform the way they build software and run their most strategic applications. Our technology is used by Global 2000 companies and developers to make software development and IT operations a strategic advantage. 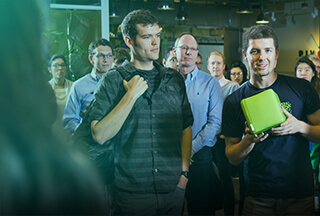 Founded in 2013, Pivotal unleashes software-developer productivity and creates an environment for innovation to scale, while fulfilling our mission to transform how the world builds software. You understand enterprise customer expectations of the software support experience, enjoy building relationships and learning your client’s ecosystem, serving as their trusted advisor and liaison, and you judge your success by your customer’s success and happiness. You may never have held the title of Support Engineer; you might have been a senior admin or software developer, or just the person who knows how to fix complex issues and collaborate to prevent future problems while keeping everyone well informed. You thoughtfully assist customers and colleagues by listening, connecting the dots, and documenting the situation and solution. You consult with Pivots in support, development, or escalation engineering as needed to address critical problems that frequently require the development of unique and creative solutions. You are personable, and bring professionalism, intuition, communication and technical agility to your daily interactions. You hold values related to kindness, helpfulness, self-awareness, and continuous learning. In Pivotal Support, we are passionate about providing our software customers with the highest level of service. We work in small teams around the globe, supporting customers 24x7. We believe in doing the right thing and working at a sustainable pace – typically 8 hours each day with occasional weekend support rotations. We are also passionate about our people, building on individual strengths, and encouraging continuous learning and certifications. And, when you’re off work, we want you to relax, recharge, and refocus. As a Designated Support Engineer, your work day is focused on a small number of clients who recognize and relate to you as their central point of contact for Pivotal product support issues, including proactive technical support, upcoming feature consultation, issue escalation, training recommendations, and communicating procedural and status updates on the customer’s complex and often mission-critical environment. You communicate regularly with customers and use your knowledge of their architecture to develop support plans, upgrade plans, and status reports recognizing their priorities, challenges, initiatives, and potential areas for improvement. You use your judgment and technical expertise to identify, document, and report issues with design, reliability, and maintenance issues. You act as the customer advocate as you work closely with Pivots in engineering, product management, and other key areas to innovate and improve performance around product requirements, enhancements, process improvements, and industry best practices. Container technologies such as Docker or container orchestration tools like CoreOS, Docker Swarm, Kubernetes, etc.